Chillin' out maxin', relaxin' al Ghul. Originally a physician and mystic living in Northern Africa, the man who would become Ra's al Ghul learned the secrets of immortality from dreams he experienced while sleeping over a node point - a place where the Earth's energies are strongest. Six hundred years later, this man operates a vast global organization, which seeks to save the planet by eliminating the majority of human life upon it and establishing absolute tyranny over the survivors. His sole opponent is the Batman, who rejected the slowly dying man's offer to become his successor. We've told you before that many episodes of Batman: the Animated Series were based on stories from the comics. For instance, the episode "The Demon's Quest (Part 1)" drew from Ra's' first appearance in Batman #232, while "The Demon's Quest (Part 2)," took from Batman #244. This figure is based on part one, or else he'd probably be stripped to the waist and ready to fight. 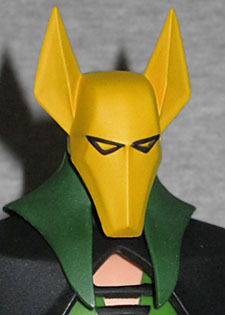 BtAS Ra's was well-designed, so this figure's head already looks more correct than the DC Signature Collection version. He has those strong cheekbones, the receeding hairline, and even his little beardlets. He's sculpted with a slight frown, and even a single, subtle wrinkle creasing his forehead. The dark circles around the eyes are what make it, though. If you watch the episodes, you'll see that the white streaks in his hair should extend all the way around his head, meeting in the back, but on this toy they stop short. We will point out that this figure is not the "plain" Ra's al Ghul design - usually he wore an ankle-length cape over a green business suit. 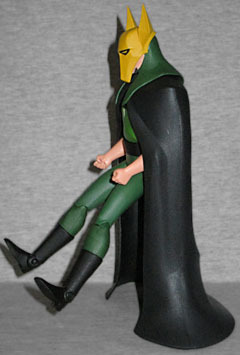 This version is wearing a floor-length black cape over a more casual style of clothing: a baggy tunic with two black ties across the chest, tight green pants, and black boots. Why the change? Well, to make it more accurate to the episode. Yes, he was drawn from the standard model sheet for most of the episode, but this outfit provides more options. The episode revolves around Batman and Ra's working together to solve the mysterious kidnapping of both Robin and Ra's daughter Talia, and when Batman finds and confronts the perpetrator in Nepal, it turns out to be (1971 spoiler alert!) Ra's al Ghul himself. The entire expedition was a test, to see if Bruce was worthy of marrying Talia, and when the ruse was revealed, Ra's was wearing this outfit. Not just that outfit, however. While acting as the mastermind, Ra's also wore a large jackal mask. 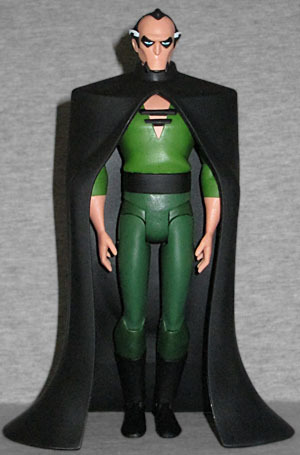 When Kenner made a Ra's al Ghul figure in their animated line, he did include the mask, as a removable piece, but he was also wearing a completely made-up suit of armor that never appeared anywhere else. This figure doesn't have a removable mask, opting instead to offer a swappable head. Sculptor Irene Matar did a really nice job at making it look like an item being worn by Ra's and not just some random animal head: for instance, if you look at the side, you can see the barest hint of his jaw peeking out from behind the egde, complete with his beard. Nicely done! 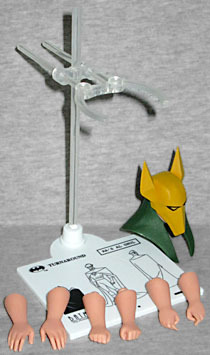 The figure moves like the other DC Direct BtAS figures: balljointed neck, swivel/hinge shoulders and elbows, swivel waist, H-hips, hinged knees, swivel boots and hinged ankles. He doesn't get the swivel/hinge wrists the other figures have enjoyed, instead only turning where his arms emerge from his sleeves. Luckily, all he really does as the kidnapper is stand around and look imposing, because the cape is molded from stiff plastic and doesn't move with him. To actually have it touching the ground when he's standing, you have to bend his knees slightly or angle the legs really far back, which sort of ruins the imposing illusion. In addition to the jackal mask, the only accessories the figure comes with are alternate hands. Well, alternate forearms. You get the idea. He has a pair of fists, a pair of relaxed hands, and a pair designed to hold non-existent accessories. Obviously he didn't use his sword until Part 2, but they couldn't have given him the gun he uses to shoot Robin? The figure includes one of the white display stands, just like the others in the line, but there's really no point to it since the cape keeps him from dynamic poses, and is too wide for the clamp to fit around anyway. 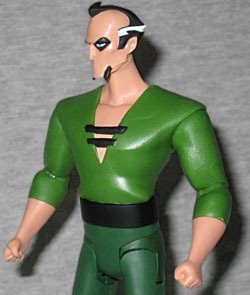 This is a very nice Ra's al Ghul figure, probably the best we've ever gotten, but it's not perfect. Maybe DCD is planning a suited Ra's for a future series, but while that might be iconic, it may not be as versatile as this take on the character.